Automated Equipment LLC is a global provider of dispensing equipment to the world’s largest food service companies. We design and manufacture innovative, state of the art, restaurant equipment which improves food service operations. Our equipment is supported globally by a group of technicians dedicated to providing highly responsive service and technical support to our customer base. You can count on our equipment to improve productivity, increase product yield, eliminate food contamination, and provide reliable portion control. 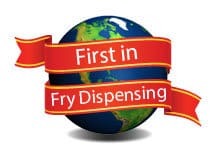 We are the leading supplier of automated fry dispensing equipment worldwide with over 23,000 dispensers in operation, confirming that customers find great value in our equipment. Automated Equipment LLC strives to be our customer’s preferred provider of proprietary and private label products and related service support. We value our ability to provide high quality products and dependable service for our customers, and a rewarding and engaging workplace for our employees. Our design team of mechanical, electrical and controls engineers are experienced in dispensing technology, food service applications as well as sheet metal fabrication and refrigeration. Our assembly technicians are experienced in electro-mechanical assembly, lean manufacturing and six sigma quality. Our combined capabilities in assembly, warehousing and logistics allow us to warehouse fabricated parts, perform final assembly and ship to the end customer. For more information regarding our Flexible Assembly capabilities and how we may be of help to you Contact Us. We have the equipment and knowledge required to design, build and foam custom cabinets or enclosures. Our team is set-up to handle your short-run or niche foaming applications. For more information regarding our Polyurethane Foaming capabilities and how we may be of help to you Contact Us. We provide global service support to our customers and can provide these services to your non-consumer customers as well. Our proprietary service database allows us to track serialized equipment. This enables our technicians to access the service history of equipment while on the phone with the customer or field service agent. It also allows us to prepare reliability and equipment incident/trend reports. We have “parts stocking” agents in locations around the world. These stocking agents combined with our drop-ship capabilities allow us to get parts to customers quickly to minimize equipment downtime. We have a network of trained service agents spanning six continents and over 50 countries. These agents are certified on our equipment by our technical support staff and are experienced in food service equipment maintenance. Our domestic call center, staffed by experienced technicians, provides 24/7 technical support. These technicians assist field service agents or operators by diagnosing problems and providing solutions, thereby minimizing equipment downtime. The call center is staffed during regular business hours with pager coverage for after hours support.